I have a confession to make. Organizing products make me happy. And products for organizing paper make me practically ecstatic. One of my favorite products at this year’s NAPO conference was Smead’s Stadium™ File. So when I was contacted about reviewing the Stadium File, along with Smead’s SuperTab® Folders and Viewables® Color Labeling System– with a Target $20 gift card thrown in for my pains — how could I resist? If you’ve been reading my tips for a while, you’ll know that I am a great advocate of using a vertical file holder to keep the papers that you need frequently at your fingertips. The Stadium File can do just that. It is a navy blue cardboard expanding file with 12 tiered sections so that you can easily locate any paper you need. For those of you who get nervous when your crucial papers are out of sight, line up several Stadium Files side by side! The Stadium File does not come with interior file folders, which leads me to . . .
It’s a Bird, It’s a Plane, It’s a Supertab! Did you ever find that those little tabs on file folders are just not big enough to sufficiently describe the contents? 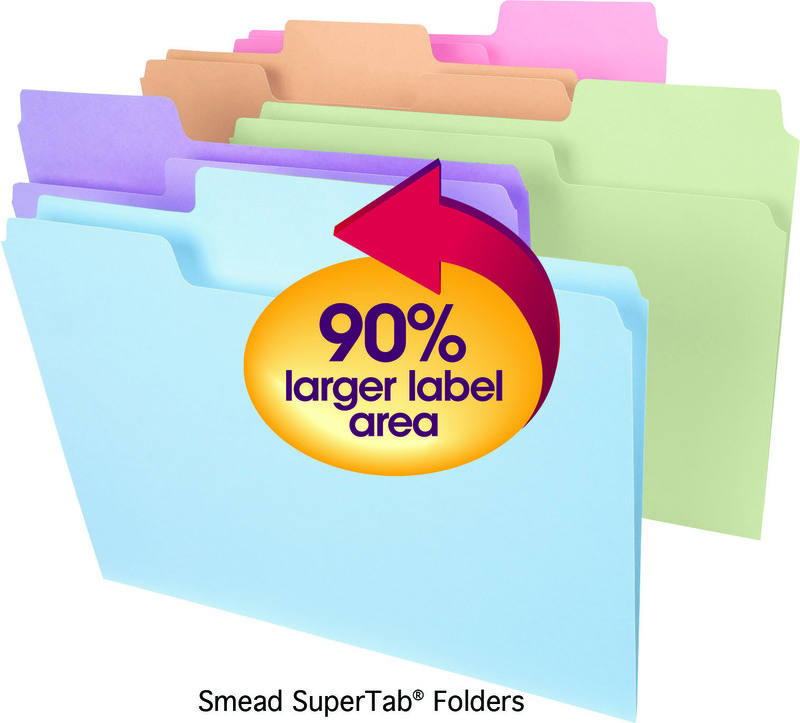 Then you’ll love Smead’s Supertab® Folders. The tabs are 90% larger than standard tabs, but still fit into a standard file drawer. And they come in so many pretty colors — primary colors, pastels, or assorted. I guarantee that you will smile every time you look at your files. I’ve always been very skeptical of color-coding when it comes to filing — such as green folders for files relating to money, blue for home, and red for vacation. My concern is that if you run out of one color, it effectively prevents you from getting your filing. done Better to stick with one color for everything — that was my philosophy. 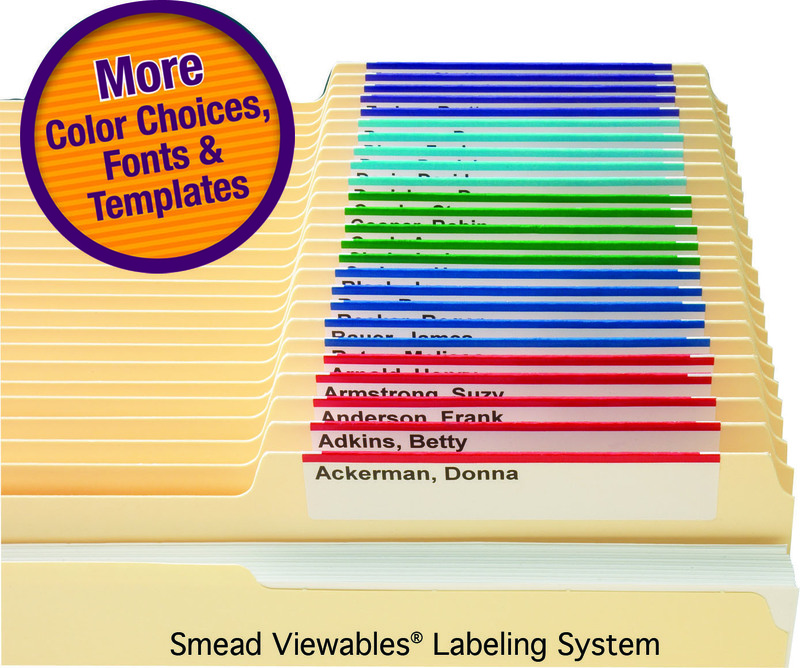 Thanks to Smead’s Viewables® Color Labeling System, you can have your cake and eat it, too. The trick is that the coloring is done by your color printer. Specify the colors you want to use, as well as the font, print them on standard labels, and apply them to any files — even hanging file tabs! All three products are available at Office Depot. Smead’s Stadium™ File can be also be purchased at Franklin Covey, and Amazon.com. 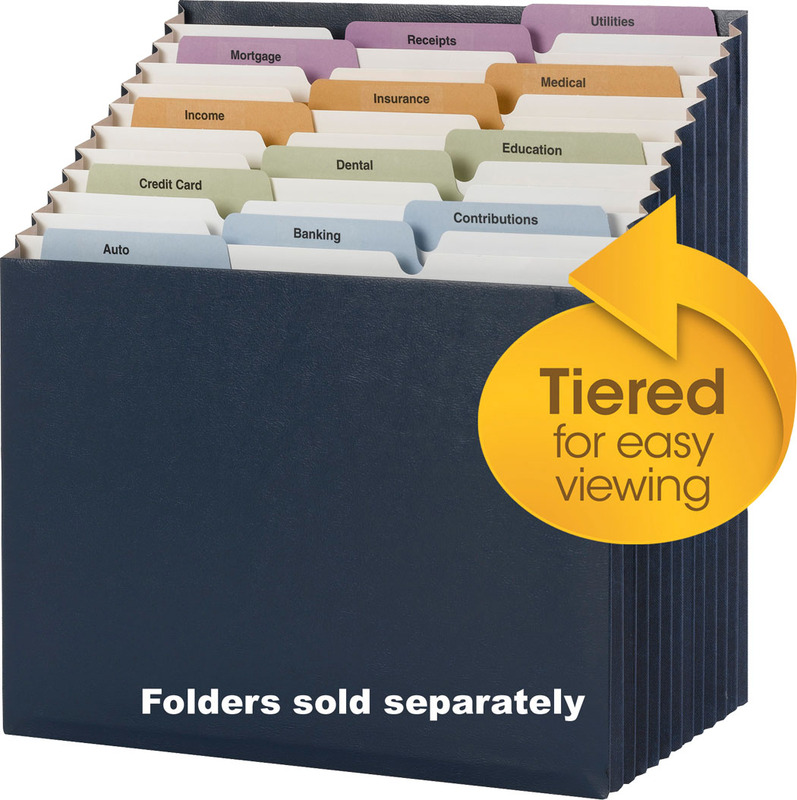 Smead’s SuperTab® Folders and Viewables® Color Labeling System can also be purchased at Staples.